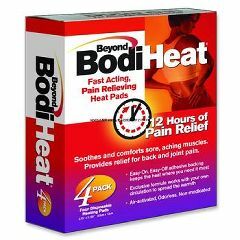 Fast acting heat pad provides 12 hours of pain relief. Soothes and comforts sore, aching muscles and relieves back and joint pain. Adhesive backing for peel and stick placement on underclothes. Exclusive formula works with your own circulation to spread the warmth. Air-activated, odorless and non-medicated. Product is supplied as a pack of 4 treatments and 6 shrink-wrapped boxes (24 treatments). Pad measures 3.75” x 5.125”. Disposable, single use only. I get really bad feet and leg cramps during the day and at night. I've used many products and creams and lotions. The other heat pads that go directly on the skin aren't good for sleeping with as I wear socks with them and it gets to hot. So my newest remedy which really works,is the electric blanket at night, so I can now get up and walk without falling and get a nights sleep. During the day I use the Bodi Heat pads on top of my socks,usually above the ankle(shoes)and I'm able to still function again. I like not having them on my skin because of the adhesive that I'm sensitive to.[... ]Thanks so much for making life a little easier and affordable in these times. I wasn't too happy with the product because it doesn't stick onto clothing and did not feel the heat as they claim. I am trying to find beyond bodiheat with the wrap belt. Have they been discontinued?